"I finally know how I'm supposed to use the weird looking pot that I got as a ... read full review"
1) A reference used to describe a North African stew, which is also known as tajine, that is made with meat and vegetables. 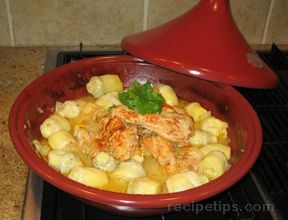 2) A glazed or unglazed circular clay pot with a cone-shaped lid that is used to cook tagine stews. It is very similar in use to a Dutch Oven, except not as deep. A traditional tagine stew combines vegetables, meat or poultry, and spices such as cumin, ginger, pepper, saffron, and turmeric that are cooked very slowly with little or no water. The cooking process, the design of the cooking pot, and the ingredients provide a moist and highly flavorful stew. 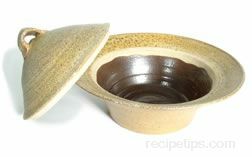 The lid of the pot forms a peak which serves as a cool surface where the hot steam can collect and condense into moisture. As the moisture collects on the top it eventually falls back onto the stew to add moisture to the ingredients, thus allowing less moisture initially to be added to the stew. In addition, the principal of this pot is to use less moisture so the flavors of the ingredients become more concentrated. Other varieties of this stew may be baked in an oven to produce a dish similar to an omelet or tortilla. Examples of a vegetable tagine may be a dish that is made of cauliflower, or eggplant and butternut squash combined with eggs and cheese to create the flavorful dish. 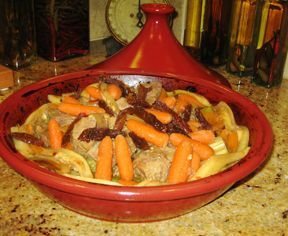 This stew may also be referred to as tajine.